When my husband and I bought our bank-owned home last month, we already had money set aside for the clothes washer and dryer we knew we’d need. But when the inspection showed someone had stuffed a gas oven where there was no gas hookup, we were suddenly looking at a much larger bill. New electric ovens start at about $500 and some can easily creep above $1,000 — our whole budget. We didn’t want the kind with coils, because me + coils = burnt dinner. We looked into buying floor models or returned appliances, but the savings were negligible where we live in Albuquerque, New Mexico. We were left with just one increasingly attractive option: used appliances. There are some real risks to this option, since even the best-maintained used appliances have given up some of their functional life. But with these few tips, used appliances can be the best bang for your buck. Here’s how my husband and I scored three top-of-the-line appliances for just $700. When you decide to buy used, there are a whole host of options — from Craigslist and yard sales to used appliance stores. And while used appliance salesmen may have the same perceived trustworthiness as used car salesmen, they offer one clear advantage: They’ll offer you a warranty. The coverage usually ranges from six weeks to three months, but regardless of its length, a warranty guarantees you’ll come home with a usable, working appliance. Warranties should be written and explicit about what is — and isn’t — covered. They should also be free, though length and coverage may be negotiable for a fee. Our six-week warranty was free, and includes a full refund, no matter the reason. Stores will usually also offer the best selection of used appliances, so you’re more likely to get the color or model you want. In our city, the stores were also drastically cheaper than Craigslist, but may not be the case in more affluent areas. Check online reviews for the past 12 months to make sure the store is reputable and has a good return policy. With a little research, brick and mortar stores offer great purchase security for used appliances. Also worth noting: Stores typically offer delivery — and many will even install your purchases for free. Our store delivered, installed (including rewiring our oven for a 220-volt plug) and hauled away our junk stove for free. You can also negotiate prices, which was my husband’s favorite part; I’ve never seen him so excited to spend money. Like the used car business, negotiating is completely acceptable and even expected. We saved close to 10% off the original offer, which was already a good deal. When you’re buying new, price dictates what you’ll get in terms of quality, style and features. But appliances depreciate quickly, so the cost difference between a used top-of-the-line and used bottom-of-the-line machine can be as little as $50. This lets you make purchases that will save you even more down the road. For example, consider buying a double-oven freestanding range. In addition to being a coveted upgrade when you sell your home, the smaller upper oven can handle most of a family’s daily needs without the expense of heating a larger space. In my opinion, these ovens’ initial price point means their construction is more reliable. Plus, having two ovens makes it easier and faster to prepare large meals. Buying used also let my husband and I afford a high-efficiency washer and dryer. 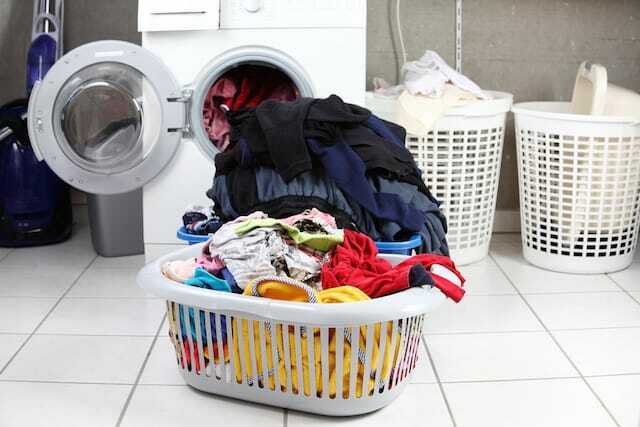 Used Energy Star washers, dryers and refrigerators only cost a little more than their energy-sucking friends, which can mean big savings on your utility bills. Buying used means you’re buying a product with only a limited warranty, so look for reliable appliances. But even the best appliance is likely to break or malfunction, so repairability should also be one of your top concerns. Internet reviews are a good place to start. How an appliance breaks is just as important as how often. Whether you’re paying someone else to repair it or DIY-ing, a washing machine that occasionally clogs the drain pump is far easier and cheaper to repair than one that occasionally burns up the main motor. Research may take longer than if you were buying new. But I found as long as the appliance was manufactured within the last five years, reviews were plentiful and easy to find. The more moving parts your appliance has, the riskier the purchase. Complicated appliances like dishwashers, range hoods and dryers will almost certainly need minor repairs within a few years, something reflected in their low used prices. Upright washers are less likely to malfunction than front-loaders — especially when comparing machines more than five years old. If they do break down, top-loading machines are usually easier to fix. Gas stoves are often easier to repair than electric stoves. Manual knobs can usually be fixed. Bad electrical touchpads usually need to be completely replaced. Keep in mind, used appliances often come with some pre-existing damage. Some of these issues may be simply cosmetic. For example, our new stove had a dent on one side, but it doesn’t affect the function at all, and it’s completely covered by cabinetry. However, other damage can affect the appliance’s function and safety. For example, glass-top stoves shouldn’t have any cracks or chips. These could allow moisture into the electrical components underneath, which could lead to possible shocks or short-circuiting. If you buy a stove with bad glass, you’ll need to replace it before you can use the stove — an expensive repair that can cost as much as a (less-damaged) used stove! Keeping these tips in mind, it’s possible to be frugal and still get a great product. My husband and I spent $700 dollars on three top-of-the-line appliances: $350 for the double-oven range, $200 for the upright washer and $150 for the dryer. We use each of them multiple times a week, and they still work as well as the day they were installed. Even better, the entire process took less than a day, the same amount of time it would’ve taken to buy new. When something else in the house fails (I’m looking at you, 20-year-old refrigerator), it’ll be an easy choice to buy used again. Your Turn: Have you ever purchased used appliances? Kimberly Marney is a newlywed, newly changed states and newly expectant mom looking to save her family money. She currently lives in Albuquerque, New Mexico.